On Sale Now! 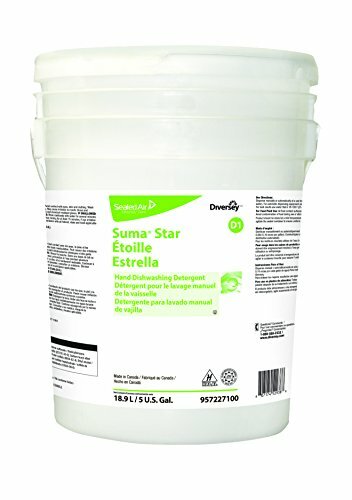 Save 4% on the Diversey Suma Star D1 Hand Dishwashing Detergent (5-Gallon) by Diversey at Blog Free Here. MPN: 957227100. Hurry! Limited time offer. Offer valid only while supplies last. Tackle tough clean-up and maintenance jobs with Suma's broad range of professional strength cleaning products, perfect for the home or workplace. Tackle tough clean-up and maintenance jobs with Suma's broad range of professional strength cleaning products, perfect for the home or workplace. Suma Star D1 Hand Dishwashing Detergent is a mid-range detergent that is ideal for cleaning pots, pans, glass, and other washable utensils. Its combination of nonionic and anionic surfactants cuts through grease and dried-on debris. Formulated to rinse away easily and leave a streak-free shine. Its stable lather provides long-lasting efficiency to help reduce overall cleaning costs. This package contains one five-gallon container of Suma Star D1 Hand Dishwashing Detergent. Suma Star D1 Hand Dishwashing Detergent is a mid-range detergent that is ideal for cleaning pots, pans, glass, and other washable utensils. Its combination of nonionic and anionic surfactants cuts through grease and dried-on debris. Formulated to rinse away easily and leave a streak-free shine. Its stable lather provides long-lasting efficiency to help reduce overall cleaning costs. This package contains one five-gallon container of Suma Star D1 Hand Dishwashing Detergent.